Untangling the City Loop means more trains, more often. It will make travel easier for you with more frequent trains carrying more people to destinations across Melbourne. Some of Melbourne’s busiest metropolitan train lines – Sunbury, Cranbourne and Pakenham – will run exclusively through the new tunnel. 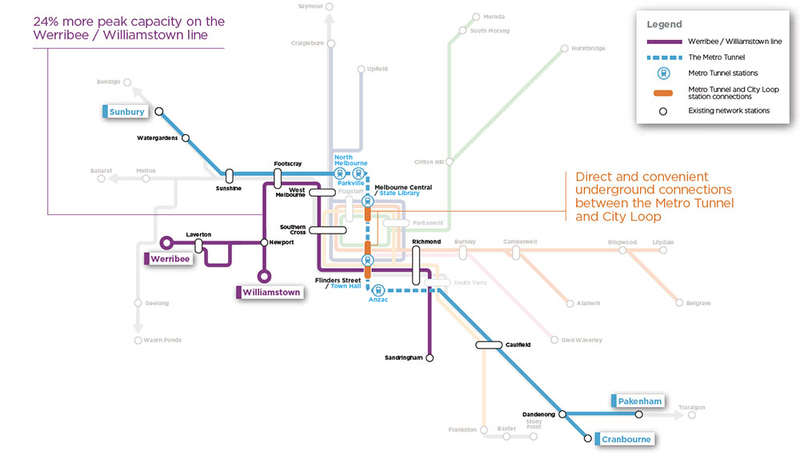 By taking these lines out of the City Loop, other lines will be able to run more services. As a result, room will be created on the network to enable over half a million additional passengers per week across Melbourne's train network to use the rail system during the peak periods. The Metro Tunnel will also bring travel time savings to passengers across the suburban and regional lines. The Metro Tunnel will benefit all Victorians by making it easier to move around the city and visit important destinations. The new Town Hall and State Library stations in the CBD will revitalise key areas of the city and will transform the way people use our train network. 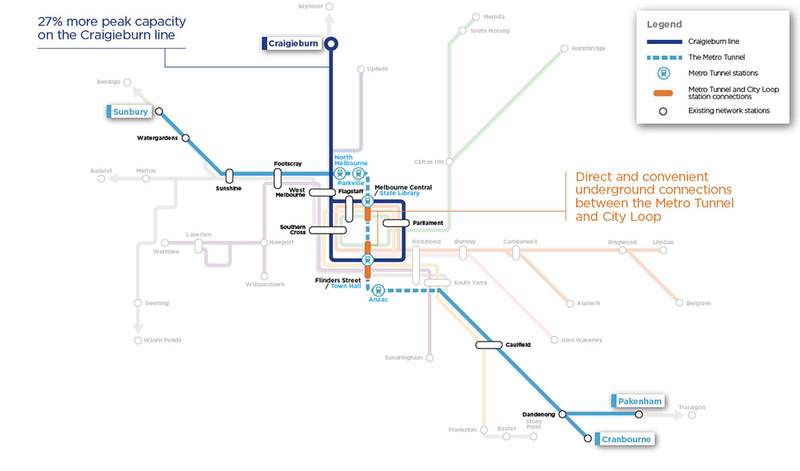 These two new stations will be directly connected to the City Loop at Melbourne Central and Flinders Street stations, allowing passengers to conveniently interchange between services, just like other metro style train networks. A new train-tram interchange as part of Anzac Station will take pressure off the busy St Kilda Road – Swanston Street tram corridor. For the first time, passengers across all lines will be able to access key destinations such as the St Kilda Road employment precinct, the Shrine of Remembrance, University of Melbourne and world-leading research and medical facilities at Parkville via train. The Metro Tunnel will create room for 54,000 passengers every week on the Craigieburn line during peak periods, that's 27 per cent more peak capacity. Craigieburn line passengers will be able to access Metro Tunnel services by interchanging at Melbourne Central station and Flinders Street Station. The Metro Tunnel will save around 5 minutes off your journey to Parkville and St Kilda Road. The Metro Tunnel, along with other network improvements along the lines, will create room for 121,000 passengers every week on the Cranbourne and Pakenham lines during peak periods, that's 45 per cent more peak capacity. The Metro Tunnel will connect the Cranbourne and Pakenham lines to the Sunbury line with five new underground stations and save up to 15 minutes off your journey to Parkville and 25 minutes to St Kilda Road. The new Metro Tunnel stations will have longer platforms for longer trains. High Capacity Signalling will be installed between Watergardens and Dandenong to further increase the number of trains that can run each hour reliably and safely on the line. 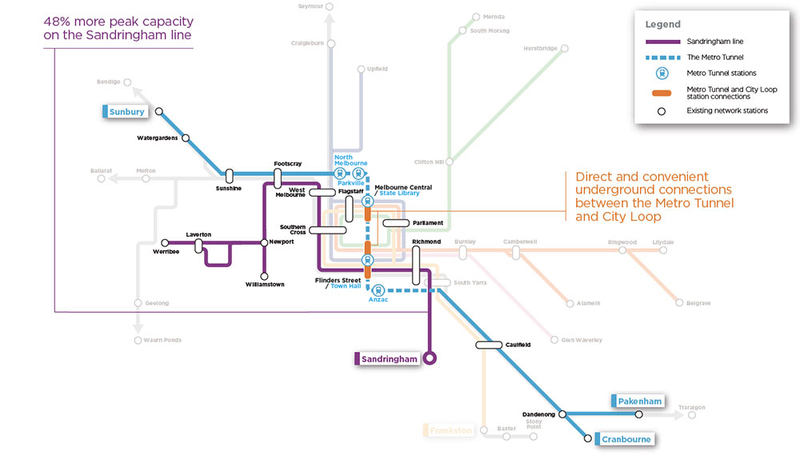 Cranbourne and Pakenham line passengers will be able to access City Loop services by interchanging at the new CBD stations which connect directly to Melbourne Central station and Flinders Street Station. The Metro Tunnel will create room for 36,000 more passengers every week on the Frankston line during peak periods, that's 15 per cent more peak capacity. If Frankston line passengers interchange at Caulfield Station, they can access citybound Metro Tunnel express services to the new Anzac Station and beyond, saving up to 15 minutes off your journey to Parkville and St Kilda Road. 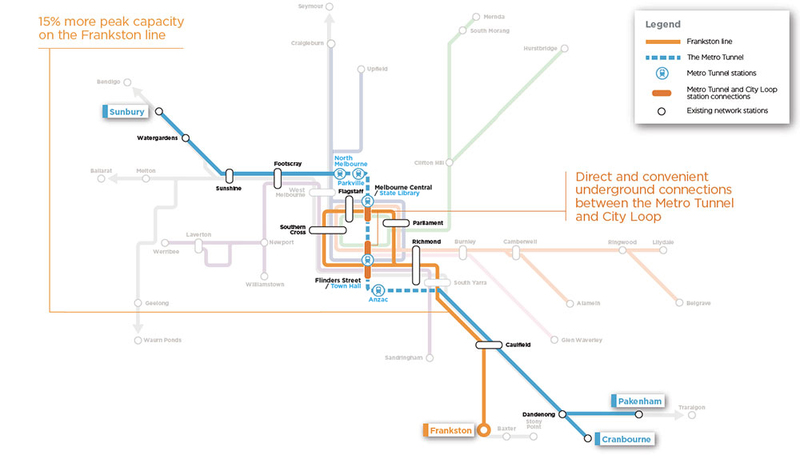 Alternatively, they can interchange at Melbourne Central Station or Flinders Street Station. The Metro Tunnel will create room for 72,000 more passengers every week on the Sandringham line during peak periods, that's 48 per cent more peak capacity. Passengers will save up to 10 minutes off a journey to Parkville and around 5 minutes to St Kilda Road. The Metro Tunnel will create room for 113,000 more passengers every week on the Sunbury line during peak periods, that's 60 per cent more peak capacity. The Metro Tunnel and its high capacity signalling will connect the Sunbury line to the Cranbourne and Pakenham lines with five new underground stations. 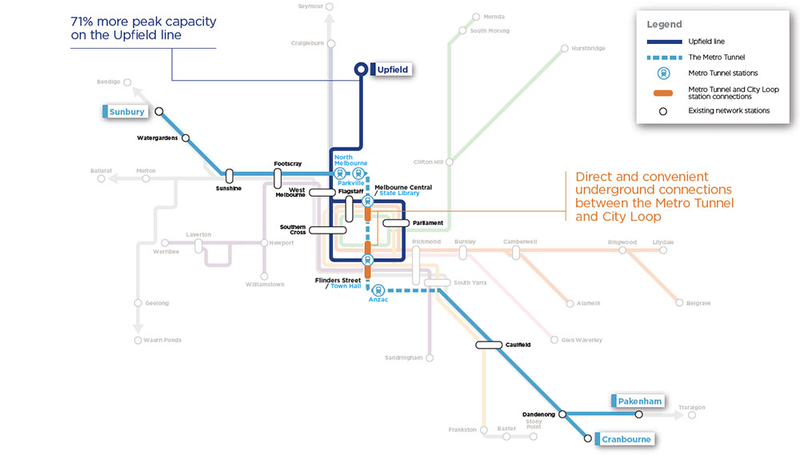 The Metro Tunnel will create room for 45,000 passengers every week on the Upfield line during peak periods, that's 71 per cent more peak capacity. The Metro Tunnel will create room for 63,000 passengers every week on the Werribee and Williamstown lines during peak periods, that's 24 per cent more peak capacity. Passengers will save up to 10 minutes off your journey to Parkville and around 5 minutes to St Kilda Road. Save up to 10 minutes off your journey to Parkville and St Kilda Road. Save around 5 minutes off your journey to Parkville and St Kilda Road. Save up to 15 minutes off your journey to Parkville and 25 minutes to St Kilda Road. Save up to 15 minutes off your journey to Parkville and St Kilda Road. Save up to 10 minutes off your journey to Parkville and around 5 minutes to St Kilda Road. Save up to 20 minutes off your journey to Parkville.